The Migratory Species Champion Programme was launched in 2014 and awards honours to those who have made extensive contributions to the conservation of migratory species and/or their habitats. The award is open to governments, companies, organizations or individuals and will be awarded for commitments of at least three years to one or more specific initiatives under the African-Eurasian Waterbird Agreement (AEWA) and/or the Convention of Migratory Species (CMS). For the year of 2018, the Government of Norway received this award and was honoured as a Champion Plus of waterbird conservation. 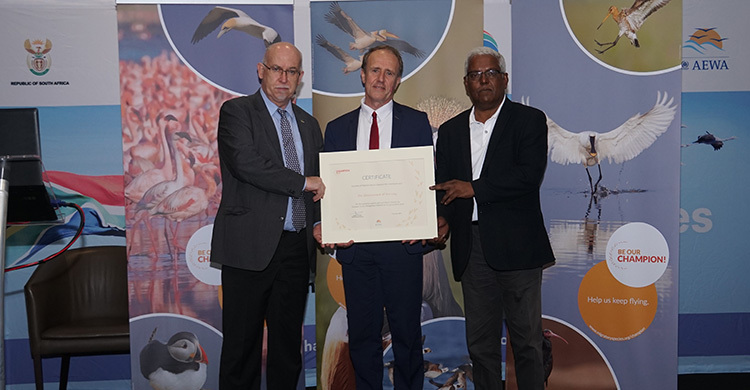 The award recognized the generous support and contribution of Norway towards the establishment of an important AEWA conservation initiative in Europe, the European Goose Management Platform (EGMP) for the period of 2016-2018. The financial commitment and political leadership of the Government of Norway has shown to be invaluable for the continued sustainable conservation of migratory waterbirds in Europe. Norway has been a long-standing supporter of AEWA conservation efforts in general and has taken on a leading role supporting the management platform for European goose populations. The award was presented to the Government of Norway at the Gala Dinner during the 7th Session Meeting of the Parties (MOP7), which took place on 4-8 December 2018 in Durban, South Africa.